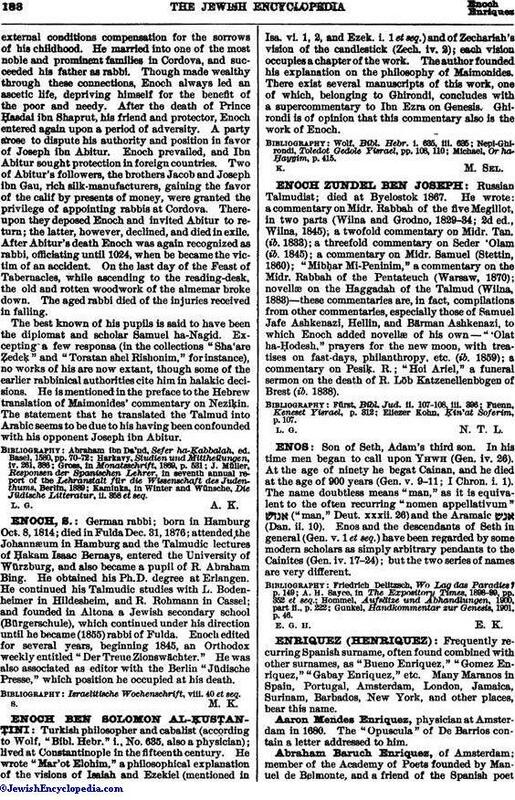 Russian Talmudist; died at Byelostok 1867. He wrote: a commentary on Midr. Rabbah of the five Megillot, in two parts (Wilna and Grodno, 1829-34; 2d ed., Wilna, 1845); a twofold commentary on Midr. Tan. (ib. 1833); a threefold commentary on Seder 'Olam (ib. 1845); a commentary on Midr. Samuel (Stettin, 1860); "Mibḥar Mi-Peninim," a commentary on the Midr. Rabbah of the Pentateuch (Warsaw, 1870); novellæ on the Haggadah of the Talmud (Wilna, 1883)—these commentaries are, in fact, compilations from other commentaries, especially those of Samuel Jafe Ashkenazi, Hellin, and Bärman Ashkenazi, to which Enoch added novellæ of his own—"'Olat ha-Ḥodesh," prayers for the new moon, with treatises on fast-days, philanthropy, etc. (ib. 1859); a commentary on Pesiḳ. R.; "Hoi Ariel," a funeral sermon on the death of R. Löb Katzenellenbogen of Brest (ib. 1838). Eliezer Kohn, Ḳin'at Soferim, p. 107.